Nigerian restaurant on South End. It opened in February 2019. It also does takeaway, with online ordering via Deliveroo. It was previously an Indian restaurant called Vael-N-Dine, which was open by July 2012 photo but closed for good some time between October 2013 and March 2014. As of March 2014 the premises were vacant photo but being renovated photo of sign to reopen as a modern European and Indian restaurant called Karnavar. This was open by April 2014 photo but closed again at the end of January 2019. As of February 2019 there was a notice in the window stating that the premises were undergoing a "change of management and refurbishment". 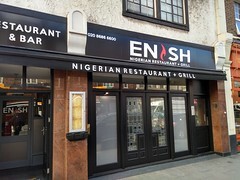 A Nigerian restaurant called Enish, part of a small chain, opened on 27 February. Last edited 2019-03-09 14:53:11 (version 50; diff). List all versions. Page last edited 2019-03-09 14:53:11 (version 50).